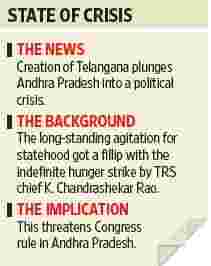 Hyderabad / New Delhi: The six-month-old Congress government in Andhra Pradesh is facing its second crisis, with the latest one threatening to lead to its collapse. On Thursday, 53 of its state legislators and two members of Parliament (MPs) resigned to protest the decision of the Congress-led United Progressive Alliance (UPA) to agree to the creation of a Telangana state out of Andhra Pradesh. The legislators belong to the two other regions of Rayalaseema and coastal Andhra. The decision, not unexpectedly, has raised questions about the fate of state capital Hyderabad since it falls within Telangana, provided a fillip to demands by other statehood movements in the country and triggered a fresh round of infighting within the Andhra Pradesh unit of the Congress party. In its second consecutive term after a strong victory in the April-May assembly election, the Congress in Andhra Pradesh has been on shaky ground ever since chief minister Y.S. Rajasekhara Reddy, popularly known as YSR, was killed in a helicopter crash in September. A section of Congress MPs from the state, including YSR’s son Jagan Mohan Reddy, met Congress party president Sonia Gandhi to argue their case against the creation of a separate state. According to one of the MPs, who was part of the delegation but did not want to be identified, the delegation argued that there was no “political mandate for the creation of Telangana. If it was so, then it would have been an issue in the recent elections and the TRS (Telangana Rashtra Samithi) would have won". The delegation also pointed out that investors who had funded projects in Hyderabad would not favour a division of the state. However, a senior Congress leader at the Centre, who also did not want to be identified, maintained that after YSR’s death, the Congress was unable to provide a strong political leadership to counter the mobilization by the TRS for the creation of a separate state. “The only option was to go with the public mood," the person added. Gandhi, according to the member of the delegation, was non-committal and maintained that she would convey their sentiments to the UPA. Meanwhile, Gandhi’s political secretary Ahmed Patel and law minister M. Veerappa Moily propose to hold a round of discussions with the same delegation of MPs later on Thursday night. The Central leadership is being careful since legislators owing allegiance to Mohan Reddy had threatened to split the party after the high command declined to name him chief minister following the demise of YSR. In fact, one Andhra MP alleged that the resignations had been encouraged by people close to Mohan Reddy—he could not be immediately reached by Mint—to partly show up the current state leadership. A senior Congress leader from Rayalaseema blamed chief minister K. Rosaiah for the crisis. “Had late chief minister Y.S. Rajasekhara Reddy been alive, the situation would not have reached this level. He would have fizzled out the movement for Telangana, while successfully controlling the law and order situation," the Congress member said, asking not to be named. “He stood against the bifurcation of the state and prevailed over the Centre on the issue for over five years." The Telangana region comprises 10 districts and accounts for 119 of 294 assembly seats; the Rayalaseema region has 52 seats from four districts, and the rest of Andhra Pradesh comprises nine districts with 123 assembly seats. The Congress party has 91 legislators from the Andhra and Rayalaseema regions, while the Telugu Desam Party (TDP) has 53 and the Praja Rajyam Party, led by actor Chiranjeevi, has 16. The Telangana region includes Hyderabad, a rival to Bangalore as an information technology destination and home to key India centres of multinational firms such as Google Inc. and Microsoft Corp. Telangana will be the 29th state in India when it is created. Andhra Pradesh assembly speaker Kiran Kumar Reddy said 53 of Congress’ 156 legislators in the 294-seat assembly had resigned. Lagadapati Rajagopal and Anantha Venkata Rami Reddy, both Congress MPs, also resigned. “This decision (to create a Telangana state) is very painful for us," P. Venkatramaya, a Congress legislator from Krishna district, said in the assembly. “Lakhs of people from other regions of the state have come to Hyderabad in search of livelihood. What would be their fate if the state is split?" In a bid to mitigate the political fallout, Rosaiah said the Union government’s decision was only to initiate the process of creating a Telangana state and not to simply concede statehood without generating a consensus through debate. “It is a long process, which will take into consideration the views of people from across the state," he said. “Statehood to Telangana is possible only if the Bill introduced in the assembly gets majority support and I request the MLAs to withdraw their hasty resignations." Opposition parties in the state, too, have entered the debate on the issue. “The hasty and short-sighted decision to carve out a Telangana state without taking into consideration the views of the public in other regions would badly affect the prospects of future generations," said N. Chandrababu Naidu, president of the TDP, the main opposition party in the state. “Such hasty moves will also prove counterproductive in attracting investment flows into the state." According to the assembly speaker, 29 of the TDP’s 92 legislators also resigned in protest. Overall, 93 legislators across parties resigned on Thursday. The TDP had for years strongly opposed bifurcating Andhra Pradesh, but reversed its stance ahead of the 2009 elections, saying it was not against a separate Telangana state. The party draws its political support primarily from coastal Andhra and parts of Rayalaseema. At the national level, the main opposition Bharatiya Janata Party (BJP) welcomed the Congress’ decision to carve out a Telangana state, but the Communist Party of India (Marxist), or CPM, opposed it saying this would open a Pandora’s box of demands for smaller states. “Though it is a good initiative taken (by the Centre) to defuse the situation in Andhra Pradesh, we have been opposed to the formation of separate states," CPM leader Sitaram Yechury told reporters. “However, our opposition did not stop the formation of Uttarakhand, Chhattisgarh and Jharkhand which have seen no development since they came into being." Soon after the Congress announced its decision on Telangana, supporters of a separate state called Gorkhaland announced a shutdown in Darjeeling, West Bengal. In Uttar Pradesh, Rashtriya Lok Dal president Ajit Singh threatened to resume his agitation for a separate state called Harit Pradesh. In Andhra Pradesh itself, some Rayalaseema-based Congress legislators led by T.G. Venkatesh are now seeking to carve out the region into a “Greater Rayalaseema" state. Jandhyla Ravi Shankar, a constitutional expert, says reconstituting a state would take several years, citing the 18 years it took for Uttarakhand though there weren’t any objections to its formation. “The issue of carving out a Telangana state is a highly complicated one with potential serious objections from north Andhra, south Andhra, Rayalaseema and Hyderabad regions," said Shankar. “The process of asset-liability allocation involves much more complex processes that take into account investments, tax collections, revenues, surpluses, assets and river water disputes," he added. “I will be surprised if the process of carving out a Telangana state takes place before the 2019 elections." In the Lok Sabha, leader of the House Pranab Mukherjee said all processes regarding formation of a separate Telangana state will be “fully followed". After the Centre’s announcement, TRS’ K. Chandrashekar Rao ended his fast and was undergoing treatment at the Nizam’s Institute of Medical Sciences in Hyderabad. Protesting against the Centre’s decision on Telangana, students from across Andhra and Rayalaseema regions boycotted schools and colleges on Thursday, demanding a unified state. A committee of students’ associations affiliated to various political parties has given a call for a shutdown in the Andhra and Rayalaseema regions on Friday to protest the proposed bifurcation.